How To Reduce Body Weight Naturally - Something New Everyday! 1) Fruits and green vegetables are low calorie foods, so over weight persons should use these more frequently. 2) One should avoid intake of too much salt. Salt may be a factor for increasing the body weight. 3) Milk products like cheese, butter should be avoided because these are rich in fat. Meat and non-vegetarian foods should also be avoided. 4) Spices like dry ginger, cinnamon, black pepper etc. Are good for loosing weight and can be used in a number of ways. 5) Vegetables like bitter gourd (Karela), and bitter variety of drumstick are useful for loosing weight. 6) Taking of honey is an excellent home remedy for obesity. It mobilizes the extra deposited fat in the body and puts it into circulation, which is utilized as energy for normal functions. One should start with small quantity of about 10 GMs. Or a table spoonful to be taken with hot water. It is good to take it in early morning. A teaspoonful of fresh lemon juice may also be added. 7) Cabbage is considered to be an effective remedy for loosing weight. This vegetable inhibits the conversion of sugar and other carbohydrates into fat. Hence, it is of great value in weight reduction. It can be taken raw or cooked. 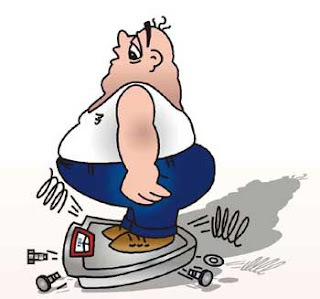 8) Exercise is an important part of weight reduction plan. It helps to use up calories stored in body as fat. In addition, it also relieves tension and tones up the muscles of the body. Walking is thebest exercise to begin with and may be followed by running, swimming, rowing. 9) Lime juice is excellent for weight reduction. Juice of a lime mixed in a glass of warm water and sweetened with honey should be taken every morning on an empty stomach. 10) Measure the portions of your food every meal and make sure that the portions are small. For example one portion of rice should not be more than the quantity which can fit in your fist. Smaller meals at a regular interval of 4 to 5 hours will keep your metabolism high and prevent your body from converting the food you intake into fat. You must also include regular exercise in your daily routine to help enhance weight reduction.